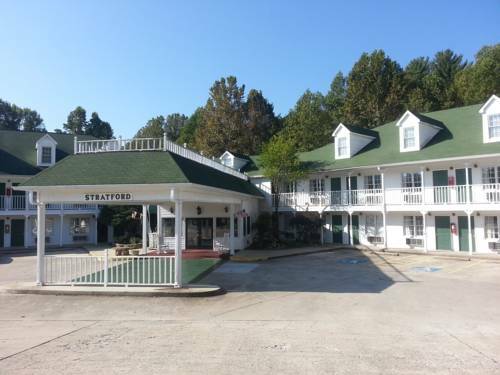 Just minutes from the Chattahoochee National Forest, the Stratford Motor Inn is close to the North Georgia Medical Center, Huff-Mosley Memorial Stadium, and Carters Lake. This Magnuson Hotels affiliate offers free breakfast each morning, free wireless internet, a seasonal outdoor pool, and a business center. Standard rooms feature free wireless internet access, cable TV with extra stations, air conditioning, alarm clock / radio, free local calls, hairdryer, microwave, mini-fridge, and iron and board. 1. Head northeast on Maddox Cir toward Maddox Dr 233 ft 2. Turn right onto Maddox Dr 341 ft 3. Turn left onto GA-515/State Hwy 515/State Route 515/Hwy 515/Rte 515/State 515 0.6 mi 4. Slight right toward 1st Ave 128 ft 5. Turn left onto 1st Ave 95 ft 6. ~55 miles from East Ellijay.